Location: Albas, in the Lot departement of France (Midi-Pyrenees Region). Notes: Château de la Blainie (by Bleynie corruption) is located in the town of Lot Albas in region Languedoc-Roussillon, Midi-Pyrenees.Overlooking the Lot, it is built around 1865 on a rock in the heart of the village, near the church, by the Quartermaster General, Stephen Pages, Inspector of the Army during the Second Empire, Governor of the Papal States, the Pope Pius IX and the Emperor Napoleon III, honor their trust. He is buried in the chapel of her aunt, Mrs. Carrie, the cemetery of Albas. This castle is sold for a piece of bread to the family Pagès discomfiture Port: Port of Gustave Pagès, mayor of Albas, was much indebted. To save his property, his mother had it banned, and place in a nursing home. Although we appliquât to hide these sad events to albassiens, it became necessary to decide to register the resignation of a mayor who was legally prohibited. This resignation is given at the beginning of October 1901. This is Mr Mourgues, notary in Albas (1886 to 1934) and deputy mayor (1888 to 1902) then became mayor of Albas (1902 to 1919), which acquires during the troubles of the family Pagès Port this castle judicial auction in Cahors for the sum of eight thousand francs, and all repairs made, became the lord for fifteen thousand francs. Crippled for some years, he died October 10, 1941, aged 82 years1. 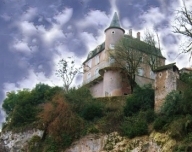 Until 2005, the castle was owned by Louis Emile Henri Mourgues (1926-2008), who had inherited from his father.